Like your favorite tee-shirt, this tote bag is just the right fit for so many occasions. 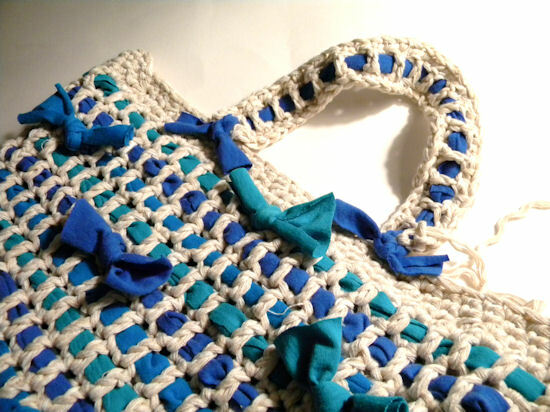 Take it to the beach, the pool, on a picnic, shopping, or use it as a diaper bag. 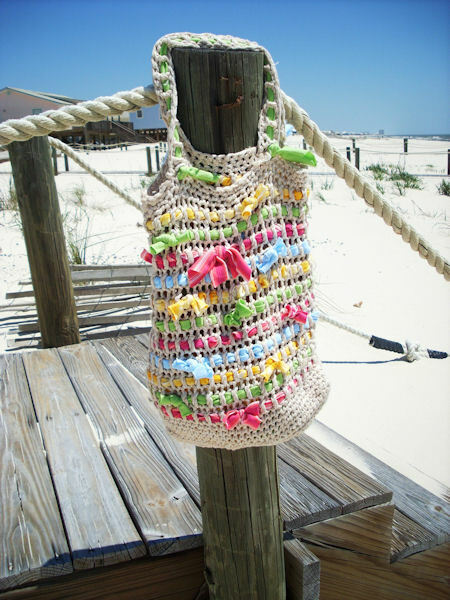 The bag is made of reclaimed 100% cotton yarn from an unraveled thrift store sweater. And, like your favorite cotton tee, it is so soft and comfy. 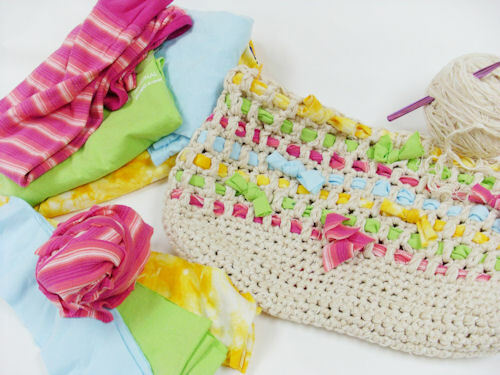 Tee-shirt strips are woven into the rounds of double crochet stitches to add stability, structure, and color. Unraveling sweaters in order to reclaim the yarn for other projects is a rewarding, green craft. 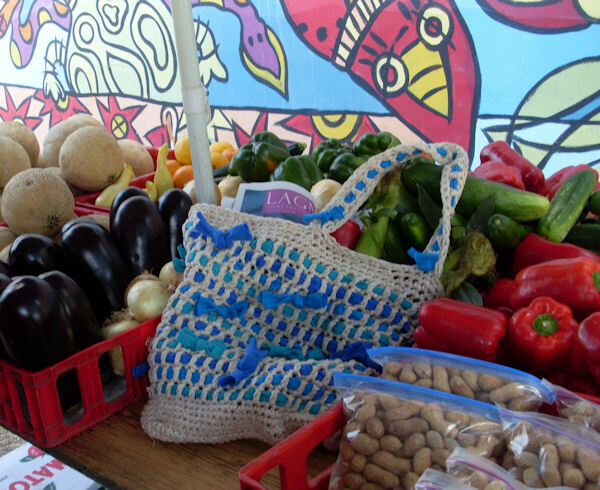 Not only does one save money while harvesting yarn from sweaters, oftentimes knitted/crocheted with fine yarns, but the environment benefits as well. See http://www.neauveau.com/recycledyarn.html for a wonderful tutorial on unraveling sweaters. 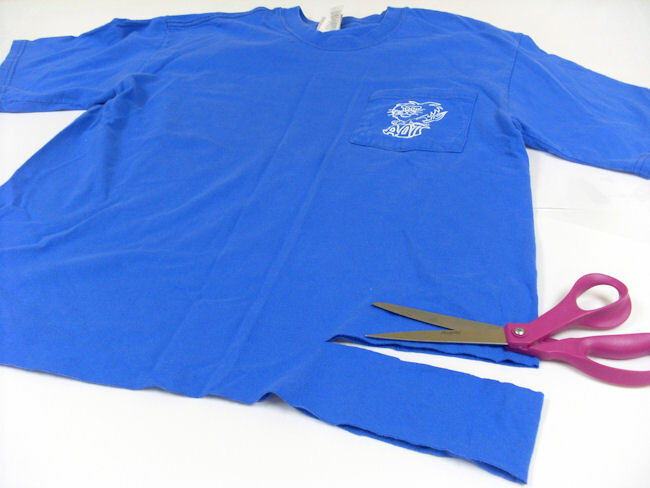 There are several tutorials on making tarn (strips made out of tee-shirts). However, for this project I simply laid the t-shirts on a flat surface, making certain to smooth both layers, and cut across in approximately 2 ½” strips from left to right side. Rotary scissors and a straight edge are not required for this project as the strips will fold in on themselves when they are woven through the stitches. Insert hook into next st, YO, pull through, insert hook into next st, YO, pull through, YO, pull through all loops on hook. Row 2 Ch 1, turn, sc in each sc across, do not finish off at last st of last rnd, but continue on with instructions for the sides. Round 28 Ch 3, dc in ea st arnd, join with sl st. Round 29 Ch 1, sc in ea arnd. Round 32 Sc in ea st arnd, finish off. Base Chain Ch 37, leaving long tail for sewing to tote. Row 3 Ch1, sc in ea st across, finish off leaving long tail for sewing to tote. Weave tee-shirt strips (tarn) through the rounds of double crochet, alternating colors as desired. 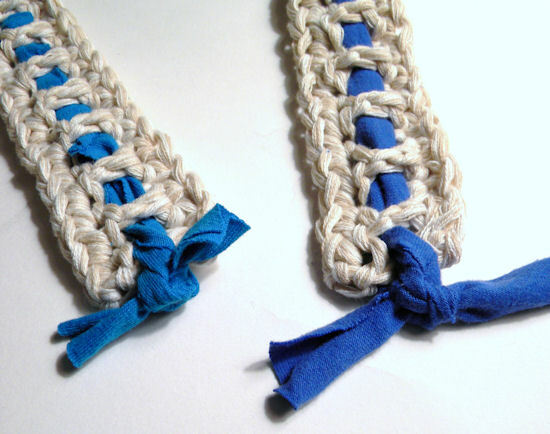 Tie the ends in a simple square knot and cut the ends off, leaving about 1 “ to form a bow shape, as in photo. Repeat for all dc rounds, alternating placement of the bow knots. For strap, weave tee-shirt strip through row of dcs, leaving several inches at the ends. Carefully cut strip down the middle just to the last dc. Weave 1 of the cut sides through the last dc. Tie the 2 ends together to form bow knot. Add Straps: Lay bag flat on surface, to locate strap placement, count 8 stitches inward from the side edge & pin strap starting at 8th stitch, sew strap securely along top edge of bag. Repeat for other side & for 2nd strap.